Replacements and repairs will be very difficult for an EIDE drive equipped DVD duplicator tower because the drive interface will be obsolete. This is a good time to switch to the new SATA technology to future proof a DVD duplicator purchase. CD Dimensions announced today it's introduction of high performance Serial ATA interface based DVD duplicator copiers. These new systems are based around CD Dimensions early research into Blu-ray duplicator technology and a high performance SATA duplicator controller. 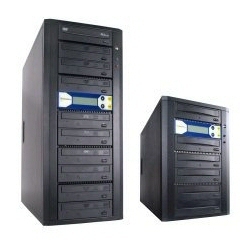 This technology is now available in CD Dimensions DVD duplicator tower and rack mount series. The benefits include better air cooling of the drives, a next generation controller that supports Blu-ray recorders and an easy upgrade path to larger hard drive storage. These units are offered in single drive DVD copier models up to 11 drive production DVD duplicator towers. The rack mount series supports 2-9 targets. "The SATA interface equipped DVD duplicators are really designed around higher target configurations where there is a cost benefit to the upgrade" said Sam Chapple, Merchandising Director. Mr. Chapple went on to say "SATA equipped units are still at a premium due to the higher cost of components. In time this will decrease as the SATA interface becomes fully adopted in computers and peripherals. Replacements and repairs will be very difficult for EIDE drives because they will be obsolete. So this will be a good time to switch to the newer technology to make sure businesses will be able to find replacement drives, if the business plans to use it for years". CD Dimensions is currently offering this as an optional upgrade to their current line of DVD duplicator copiers. It is a standard feature in CD Dimensions Blu-ray duplicators which also support DVD and CD recording.